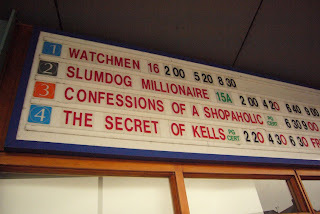 On the March 22 episode of The Spirit Level theres a little piece with me and Robin Adams talking about the film and the Book of Kells. They showed wee clips from the film too. You need to scoot up to about 47;57 if you don't want to watch the whole episode! Bah. My trusty tablet PC went wonky on me over there. Am back in Kilkenny now. Paul is staying on for the second screenings in Pixar and Disney. 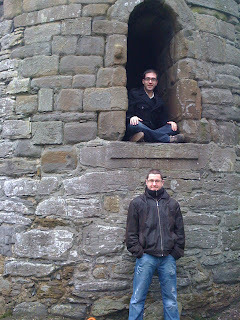 into finishing up the second Glenat album. Jet lag or no Jetlag. The Disney screening was slightly marred by a bit of trouble with the projector which interupted the flow of the screening while it got sorted. 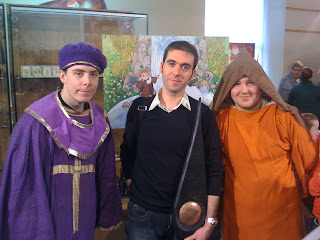 However the audience was very patient and supportive. It was a real thrill to meet Andreas Deja and Eric Goldberg. HMM? 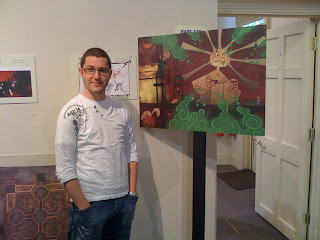 CARTOON Saloon, an animation house based in Kilkenny, has put together a feature based around the creation of The Book of Kells. The prospect is not altogether an enticing one. One imagines a soberly narrated, drably animated information film, suitable for tourists queuing up at The Kells Experience: “Here we see the monks boiling up beetroot to prepare the cochineal dye.” And so forth. 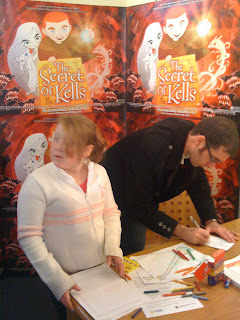 Happily, The Secret of Kells is not like that at all. Director Tomm Moore and his talented team – hunch-shouldered in darkness, one imagines, like those ninth-century monks – have assiduously avoided lazy options to deliver an entity of considerable beauty and originality. Fans of Genndy Tartakovsky, the Russian animator of classic series such as Samurai Jack and Dexter’s Laboratory , will admire the way Moore bends the Russian’s key techniques (bold lines, eccentric camera angles) to his own, very different ends. Wolves are rendered as jagged flashes. The Vikings become looming tree- people. Equally impressive are the flat, painterly backgrounds, which nod towards the perspective-free world of pre-Renaissance art. The script is not quite as impressive as the visuals. 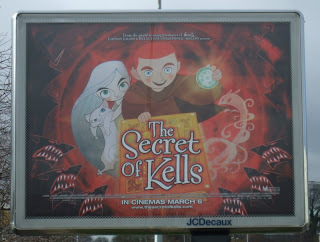 Almost entirely abandoning any reference to Christianity for nods towards other, more ancient myths, the film follow young Brendan (nicely voiced by Evan McGuire) as he falls out with his uncle (Brendan Gleeson), a stern Abbot, and makes friends with another, more eccentric monk named Aidan (Mick Lally). Inspired by Brother Aidan’s talent for illumination, Brendan gets drawn into the quest for a magic jewel and, in his wanderings, encounters various monsters, sinister Norsemen and a sort of benevolent female wolf-spirit. The story does have a neat arc and the voice-work is first rate, but the thinly drawn characters are sometimes upstaged by the bold images and by the fine, insistent music from Kíla and Bruno Coulais. Moreover, the desire to pack in so much research seems to have occasionally overpowered the need to create a clean narrative line. These are quibbles. 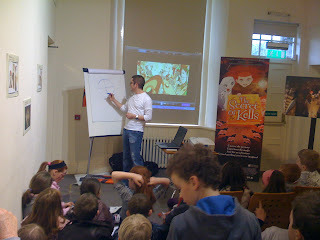 The Secret of Kells remains a surprising piece of work that should appeal to smart children and open-minded adults. Chemically befuddled students may enjoy it even more. 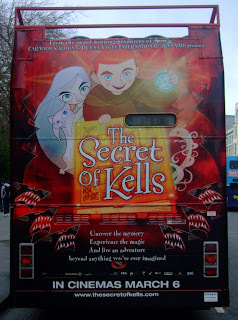 Advertising on the back of Dublin buses. I hope I see them before they are done there run up there. 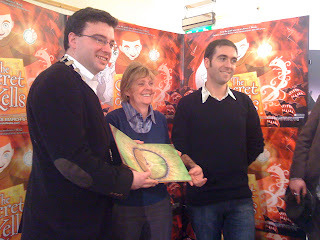 Last night Nora and I attended the screening in the Cork French Film Festival. 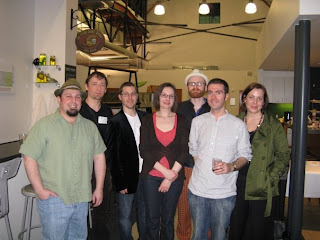 It was great and some old friends from Cork came along too. 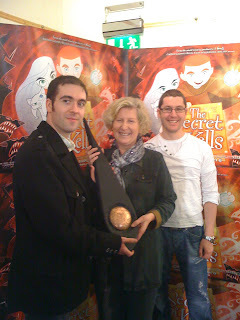 Tonight we have the Kilkenny launch in aid of Young Irish Filmmakers. 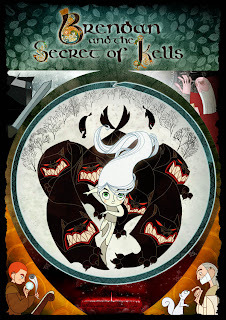 Set in ninth century Ireland this extravagant animation from Kilkenny based imprint Cartoon Saloon fashions a genuine no-kidding entertainment from the origins of The Book Of Kells. 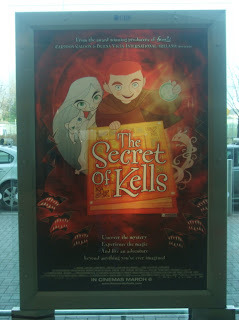 Jollied along by early Christian and late pagan mythology, Tomm Moore's good looking first feature opens in Kells Abbey where a mischievous 12-year old named Brendan (voiced by the talented Evan McGuire) scampers about under the stern gaze of his uncle, the Abbott (Brendan Gleeson). 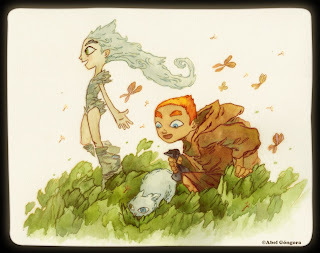 Inspired by the rock star presence of master illustrator Brother Aidan (Mick Lally), the boy is soon exploring the black recesses of the forest beyond the walls. The youngster soon befriends a mysterious sprite (a giggling Christen Mooney) and masters his fear of the dark but faerie power will not be enough to keep the encroaching Norsemen at bay. Though budgetary constraints occasionally tell when high-octane movement is required, this is a beautiful, unique project that deserves to find an audience beyond mandatory school trips to the cinema. In addition to attractive characters and lush designs derived from the precious manuscript of the title, this is a pleasingly jingoistic reminder of a time when Ireland saved civilisation. We're great, we are.